In the battle against vermin, man has many tools at his disposal. But, poison may just be the one you need if you want to play dirty. They don’t deserve any better, anyway. And that’s why we wrote this article. Read on if you want to find out how to make mouse poison. Catching mice can really be a nightmare. Everyone advises you to make or buy mouse trap because they’re supposedly the easiest way to catch a mouse. But there are so many things you need to take into account when making traps. 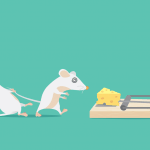 Things like how much bait to put, what materials to use, how to get rid of the mouse later.Even when you’re buying a trap, you still have to go through the whole set up and make sure you placed it correctly. This will take care of this pesky little problem in a jiffy. 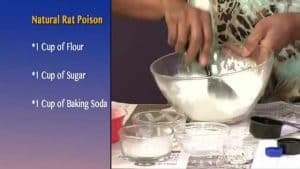 You can use several methods to make proper rat poison. Sure, you can buy some at the store, but this is a safer, faster and more effective alternative.It takes only a few moments of your time, anyway. The best part is most of the ingredients mixed together in these poisons are safe for humans. That means that the consequences of your child or pet getting to the poison will be much less severe. They may even be nonexistent. The first method you can use involves sugar, baking soda, and flour. You will need one cup of each. So that’s one cup of baking soda, flour, and sugar. Just to clarify, one cup is around 128 grams. Mix these together in a large bowl. Now that you’ve thoroughly mixed the ingredients, put the dry mix in small plastic containers. 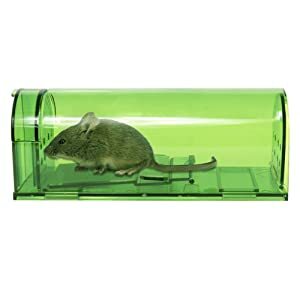 The containers should be easy to eat out of since you want the mice to eat the poison.Now you just have to wait.The way it works is that the baking soda reacts with the acids in the mouse’s stomach. This reaction creates gas, and since mice can’t pass gas, it will build up in their stomachs. This will cause an internal blockage or rupture. Their digestive system is much more different than ours, as you can see. The second method uses milk, cornmeal, and plaster of Paris. For this poison to work, you’ll need to take a large bowl first. You should fill it with a quarter pound of plaster of Paris and a quarter pound of cornmeal. Plaster of Paris is a very useful material that you can find in craft or hardware stores. When you buy it, it will be completely dry.You will need to add some liquid to it to make it harden and over time it will become completely solid. When mixed with liquid, this material thickens and hardens. Once you’ve thoroughly mixed these two ingredients, add around 2 cups of milk. If you notice that some parts of the cornmeal and plaster are still dry, don’t be afraid to add more milk.The mixture should now resemble dough. You should use your hands and knead it to make it even more dough like. The next step is to break off a few inches of the dough and roll them in your hands until they start to look like a little ball. Do this until there is no dough left.Now take all of those little balls and place them in various locations in your house. Best if you pace them where mice are most likely to look for food. One such location is definitely in the fridge or behind the counter. Check your poison after a few days.If the mice haven’t chewed up the balls, then you will need to make a new batch and place them all around the house. Placing them behind the fridge and counter is not enough. You’ll need to do this because the plaster will harden too much after a few days, and it will be useless. The plaster of Paris is useful for another method, alongside instant potatoes. You will need slightly less plaster for this one to work, though. That said, you will need a whole packet of instant potatoes. Mix these two into a large bowl. Only take a large cup of plaster. You should add a pinch of cinnamon to the mixed ingredients.Now that everything’s together, add a cup of water and keep mixing. Once you’re done stirring, pour the mixture into small tins. Find the rat holes and other hiding locations and place the poison there. Killing the mouse is only part of the job, as it is equally important to get rid of the remains. If you fail to do so, the stench will get awful, and you risk getting a variety of diseases mice can carry. There are certain steps you can take to safely get rid of the mouse’s body. This will ensure that neither you nor your family gets infected with anything the mouse might be carrying. This is why it’s important to check your poison frequently; it’s better than you find the mouse than your child or pet. First thing’s first, get some rubber gloves. These can also be made out of latex or vinyl if you don’t have rubber gloves handy. You should get a disinfectant for this process. If not, a mixture of water and bleach will work. Put this in a spray bottle and spray the dead mouse alongside the area where it’s lying. You’ll also need a plastic bag to put the mouse in. Everything the mouse has left behind should be placed in the bag with it. This includes droppings, nesting materials, and food. Now seal the bag carefully. Don’t push out any air out of the bag because you will risk releasing bacteria and viruses into your environment. Now take that bag and put it in a bigger one, sealing it, too.Throw the bags into the trash. Don’t do it inside of your home. Instead, take the bags and take them aside, throwing them into a big trash can with the other garbage. Wash your gloves with water and soap, then spray disinfectant on them.Finally, thoroughly wash your hands. Hopefully, this article has been useful. 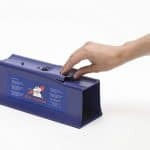 We also hope that it will teach you how to make rat and mouse poison safely and efficiently. Remember to stay safe, wash your hands and dispose of the dead mouse properly. If you follow these instructions, you will get rid of your rodent infestation. You will also stay safe at the same time. And we also hope that it will help you in the battle against rodents. With little effort, your mouse troubles will be a thing of the past. This vermin has been an annoyance for millennia. No more rodents, no more nuisance, no more annoyance.